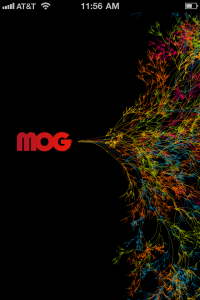 MOG is a life changing experience for serious and casual music lovers who want to hear precise tracks, albums, and artists — when and where and how they desire to hear them. MOG’s web site and iApp are works in progress, that requires a modest paid monthly subscription for an astonishing quantity of top quality audio selections. This MyMac first look and listen will introduce readers to some of MOG’s best features. Subsequent articles and podcasts will go deeper, with additional praise and criticism. thousands of ready-made playlists, and much more! 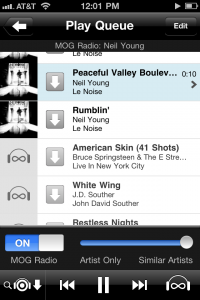 live sync between web and mobile setting and much more! MOG is now available on GoogleTV and Roku boxes, so you can leisurely enjoy MOG from the comfort of your couch. This service is free for all MOG subscribers. Of course, the 14-Day Trial is totally free, and you can cancel at any time! MyMac recommends you take advantage of Primo, because it runs beautifully on iDevices, and Roku boxes. Only one MOG stream to one destination can be live at any one time, which is not a drawback. MOG has a large social network community of music bloggers, called MOGgers, but they are not worth ten dollars each month. The same can be said for MOG’s custom playlist capabilities. Where this service shines brightest and sings loudest is in three areas of expertise: unlimited downloads, CD quality audio, and exact music choices. It is not easy to stump MOG, but it is possible. 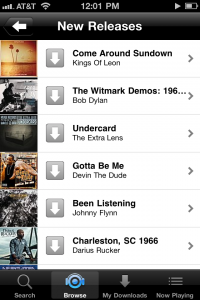 Nine million CD tracks are now on the service, with more being added every day. According to Anu Kirk, “If it’s available at all from the record labels, we have it.” What is remarkable is how wide and deep is the ocean of MOG music. I could give you a hundred examples, ranging from Laurel and Hardy’s “On the Trail of the Lonesome Pine” to the powerful and varied jazz vocalist Lizz Wright, from Adele’s gorgeous version of Bob Dylan’s “Make You Feel My Love” to the frightening variety of Christina Aguilera’s career releases, country tracks from Webb Pierce to Trace Adkins and beyond, or much MUCH more, such as four albums by the Buffalo Bills, a famous male barbershop quartet. Surprises arrive with every batch of streaming tracks, which can concentrate on a single artist, or include a vast arrange of similar performers. 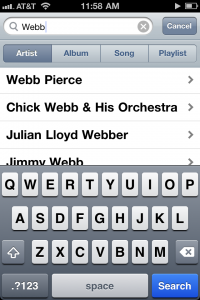 MOG’s Search feature yields accurate results, except for classical selections, which are not named in the same way as are pop or jazz tunes. Weekly email bulletins keep subscribers up to date on the latest releases. Web and iDevice suggestions are profuse, often leading to unexpected delights (or amazing klunkers). During the first few sessions using MOG, regardless of your prior experience with Internet music services, you will be slightly confused on how to proceed, because the Web interface is imperfect, although the iApp is nearly perfect. There are not extensive FAQs, tutorials, forums, or Help guides, although the company “plans to create a user help guide in the very near future.” iTunes on my iPod Touch is a similar user interface to MOG on the Touch, which is where I use MOG most of the time. MOG has an “artist similarity” algorithm developed with a number of technologies, including some bits from The Echo nest. Right now, the slider just determines the amount of these tracks mixed into the list, so at left position it is 100% “seed” artist and no similars, at center it is 50% seed artist and 50% similar and at right it is 100% similar artists, 0% seed. Currently, if you let the radio play, it will change the seed on the 10th track. So the more similars you have, the greater chance your radio playlist starts to “wander” from your original artist. MyMac recommends you take advantage of MOG’s free trial and hear for yourself how good it is. Although its web interface needs improvements, MOG, as represented by Anu Kirk, convinces me with each hour of enjoyable listening that I can’t live without it. All iPhone MOG screen shots above were provided by the company for our use in this article. Love MOG! I can’t live without it either!